Explanation: This false-colour image of the young Trapezium star cluster in the Orion Nebula was made with an infrared camera at wavelengths about twice as long as visible light. 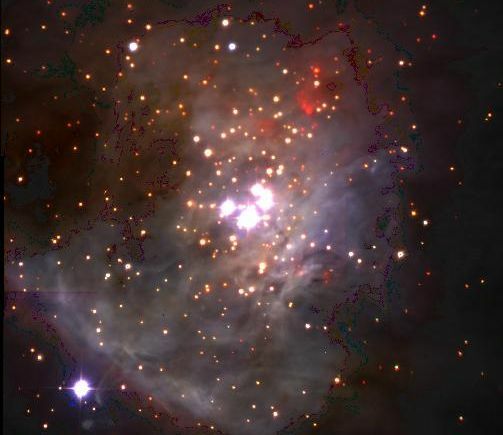 The infrared data are part of a sensitive survey of this nearby star forming region in which astronomers have identified over 100 extremely low mass objects -- candidates for elusive brown dwarf stars. Brown dwarfs are failed stars with masses so low (about 8% of the Sun's) that they can not sustain nuclear hydrogen burning, a sun-like star's main energy source. While brown dwarfs are thought to be still massive enough to burn deuterium for energy, thirteen of the low mass objects show evidence of lying below even the deuterium burning limit (about 1.3% of the Sun's mass) falling in a range more commensurate with giant planets. These drifting, "free-floating planets" are perhaps as little as 8 times as massive as Jupiter and likely formed along with the cluster stars a million or so years ago. They are detectable in the infrared because they are still hot from formation, but will eventually cool and fade. If the Trapezium is typical of young star clusters, then the survey results suggest that brown dwarfs and free-floating planets may be fairly common, but there are not enough to solve the mystery of dark matter in the Universe.